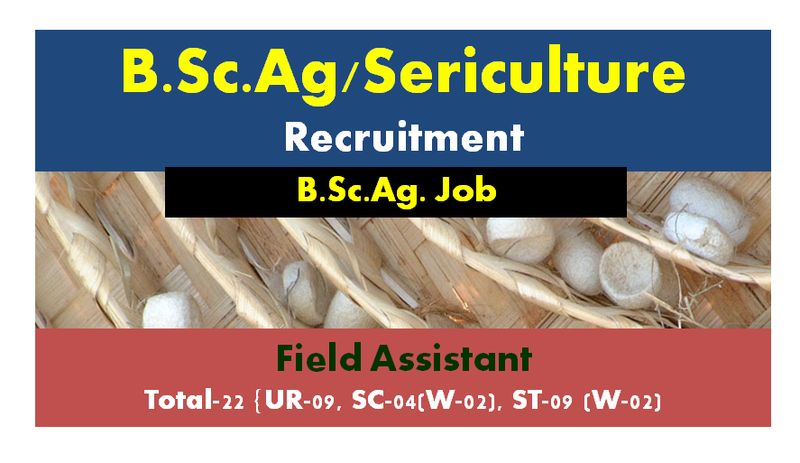 Qualification: (a) B.Sc in Sericulture from a recognized University, Or (b)B.Sc (Agriculture)/B.Sc in Botany & Zoology with Post Graduate Diploma in Sericulture from a recognized University or Central Sericulture Research & Training Institute of Central Silk Board, Or (c)2'd Class M.Sc. (Agriculture) in Entomology, Or (d)2" Class M.Sc.in Botany or Zoology or Life Science. Age: Must not be below 21 years and above 32 years as on 1.1.2017. Application Fee: Rs.100/- (can be remitted online through Odisha Treasury Portal (e-chalan) or Treasury Chalan in any Treasury/Sub-Treasury under the prescribed Head of Account. "005 l-PSC-104-UPSC/SSC-Examination Fees-0047-Fees collected for conducting examinations-02041-Examiantion Fees".Rs.100/- (can be remitted online through Odisha Treasury Portal (e-chalan) or Treasury Chalan in any Treasury/Sub-Treasury under the prescribed Head of Account. "005 l-PSC-104-UPSC/SSC-Examination Fees-0047-Fees collected for conducting examinations-02041-Examiantion Fees". 1. Date of ACTIVATION of the Online Application for the post will be notified shortly. Candidates are advised to be in constant touch with the above website to apply for the post. ii) Candidates are required to apply through Online Mode only after publication of Detail Advertisement in OSSC website. The candidates applying for the post must go through the Detail Advertisement and ensure that they fulfil all the eligibility criteria prescribed for the post as laid down therein. Admission of a candidate for the written examination & other Tests shall be provisional and would be on the basis of the information furnished by him/her in the Online Application form only. 2. If at any stage of recruitment or thereafter, it is found that any information furnished by the candidate in his/her online application is false/incorrect or the candidate has suppressed any relevant information or the candidate otherwise does not satisfy the eligibility criteria for the post, his/her candidature for the Post/Examination will be cancelled forthwith and he may be debarred either temporarily or permanently from appearing any further recruitment examination (s) conducted by Odisha Staff Selection Commission.